What Type of Dent Removal Does Your Car in Reno Need? If you have had a little fender bender in Reno and your car has some dents, there are a few things you should take into account before you attempt a DIY dent removal process. The dent removal process at a Reno auto body repair shop will differ depending on how bad the dent is. If the ridges of the dent caused paint damage as well, then paintless dent removal may not be an option for you. There are a few DIY dent removal options for your Reno vehicle. There are a lot of different tricks to make a dent less noticeable on your car. You can use a plunger (make sure it’s clean!) to apply suction to the dent so it pops back out. 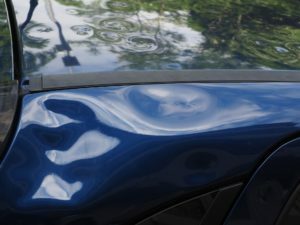 Another fan favorite of dent removal tricks is pouring boiling water over the dented area. The heat from the boiling water makes the panels more malleable so you can reach around to the inside of the panel and pop it out easily. If you are going to try a do it yourself dent removal option on your car in Reno, you may want to look into getting a DIY dent repair kit. Use a dent pulling tool to pop the dent back out, and a dull hammer or something with a soft head to slowly even out the panel. You will want to make sure to not distress the metal so much that it stretches out. Visit an auto body repair shop in Reno for professional dent removal services. You may think that dent in your car is not causing any problems as you drive around Reno, but other parts of your car can be affected besides the outer body of the car. You may keep driving after a small collision, but there could be more damage to your car than meets the eye. Airbags and safety restraints in cars are engineered to go off at a certain time based on the time of the impact of a collision. There are sensors in your car’s panels, and dents can affect the timing of the sensors to initiate your airbag in the event of a collision. Even if you have to make do with dent removal using a hair dryer as a quick fix, it is still worth your time to take your car to an auto body shop in Reno to make sure your car will still be safe in the event of a crash. You can bring your car to us for dent removal in Reno, and we can perform a paintless dent repair if your car doesn’t need a more exhaustive dent repair. Our team at Liberty Collision is dedicated to safe and proper repairs. At Liberty Collision, we offer a lifetime guarantee on all repairs so you can have peace of mind when you drive your car. From dent removal to car paint touch ups, Liberty Collision has you covered. Contact us at Liberty Collision for your dent removal needs in Reno today!